Fun Fact Friday! #187 Secrets, Secrets CAN be fun! We all know that being “in” on a secret is exciting and tempting. Throw Disney into the mix and you know it’s going to be wonderful! I was recently made aware that Disney has a really fun secret! If you have the pleasure of staying at Disney’s All Star Movies resort, head over to the World Premier Food Court and visit the Roxy counter. Ask about the “Secret Menu”, and you will be presented with a briefcase that contains a Viewmaster (remember those?!) which you use to scan through a uniquely awesome secret menu! The items on the menu are pretty interesting and if I were you, I would order all three! First, a bacon mac-and-cheese dog. Indulgent but not too crazy (it gets weirder)! Second, you can try Poutine with Cheese Curds and Gravy. Not weird, but definitely different, unless you’re Canadian! Third – and here is where it gets funky – a Cinnamon Bun and Candied Bacon Burger! Now, I don’t eat pork, so I would take that away, but I really would like to try this weird fusion of super sweet and savory! “Home” sick – as in missing Walt Disney World. I follow a ton of blogs and Facebook pages that refer to WDW as their “home” and so I thought I would borrow it. While I was just there in October for a short five-day trip, it’s been difficult for me to look over my photos from that time. Why? Probably because I have so many feelings about them. I really enjoyed my solo vacation, it was a lot of fun and I got to do things that strictly I wanted to do. I knew leaving would be tough because I don’t know when I’ll ever be able to get back there. Sure, I could realistically travel any time, but I feel a bit guilty going knowing that some people at home can’t go. Guilt, guilt, guilt! Anyways, it’s been six months and that means it’s time to share some photos from my trip. 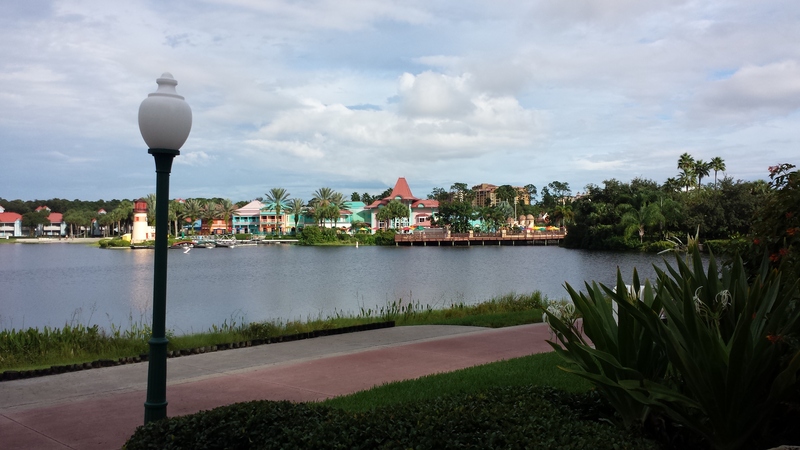 I took a bunch, of course, but this week ‘ll focus on the pictures I took around the Caribbean Beach Resort, where I stayed. I was super close to the pool! Although… I didn’t go swimming. Beautiful view at the end of the walkway. I was so close to the water. 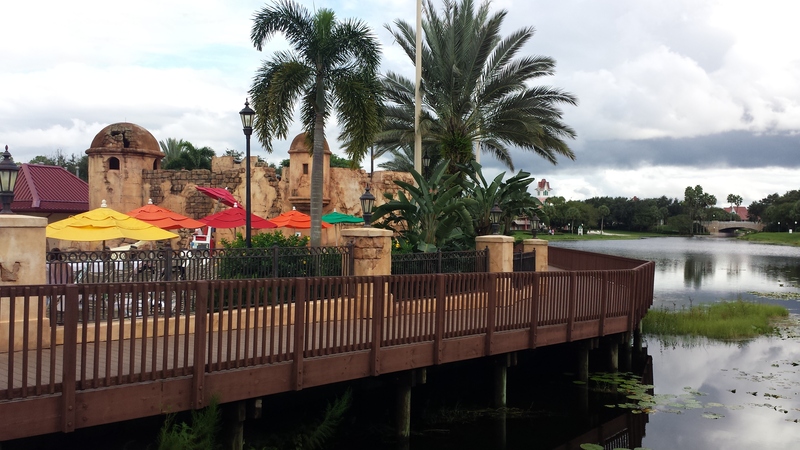 See the colorful buildings across the way – it really felt like I was in the Caribbean! Each “Island” has its own beach. It was very quiet when I went down in October. 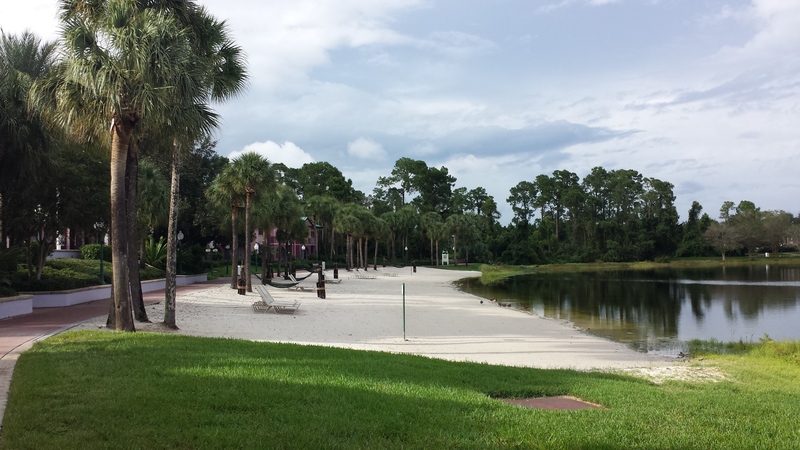 Had I been there longer, I would have taken advantage of the beach chairs and lounged around, but I wanted to get as much Disney time in as possible! This bridge connected Aruba and Jamaica to the Center or hub, where there was a food court, some shopping, a really cool Spanish-style pool, and bus pick up. Inside Caribbean Cay was a hidden play area and a perfect viewing area of the sunset. Coming around the bridge, you can see the neat pool they had there. This is “Centertown”, the hub. It was really cool inside. They had painted the ceiling with clouds so it felt like an open-air market. Good food, too. While the CBR was absolutely stunning and transported you the the Caribbean, all in all, it wasn’t one of my favorites. 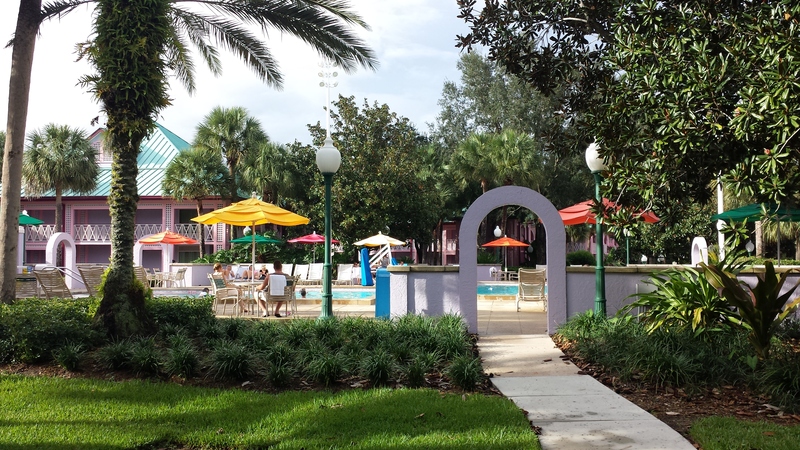 If I had more leisure time, maybe, but this resort had almost completely eliminated any reference to “Disney”, so it sort of felt like you weren’t actually at Walt Disney World. Some people might be looking for a retreat away from the parks, and that’s fine, but as for me, I really enjoy being immersed in the Disney world! I also wasn’t a fan of the busing system, as I felt it took to long to get out of the resort. The buses had to stop at each island for pick-up/drop-off, and there were a few of them, about eight if I remember correctly. So it took a while to get in and out. Also, I was lucky to be staying in Aruba, which is located across from Centertown. But certain other “islands” were super far away from Centertown, and after all the walking you do in the parks, having to walk to the hub for a drink/snack/toiletries/etc… must have been a bummer. Again, it was beautiful and serene, but that wasn’t what I was looking for. 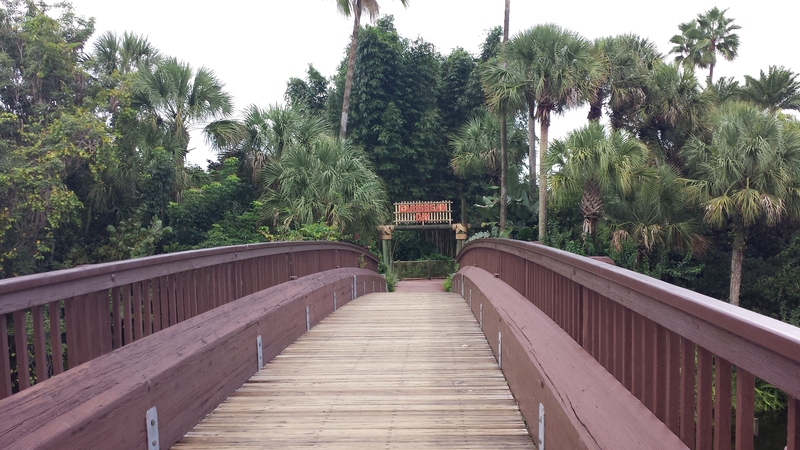 Next time – whenever that may be – I think I’ll check out on Port Orleans. Anyone else have any suggestions? I found this at allears.net, where they have a bunch of recipes from the parks. This is a rich, hearty pasta meal that is ridiculously simple to make, but looks and tastes like it took hours to prepare! In other words, it’s my favorite type of recipe. I made some adjustments to the original, and after I tried to meal, I have a couple of other suggestions. This was my first time using the ingredient chorizo. 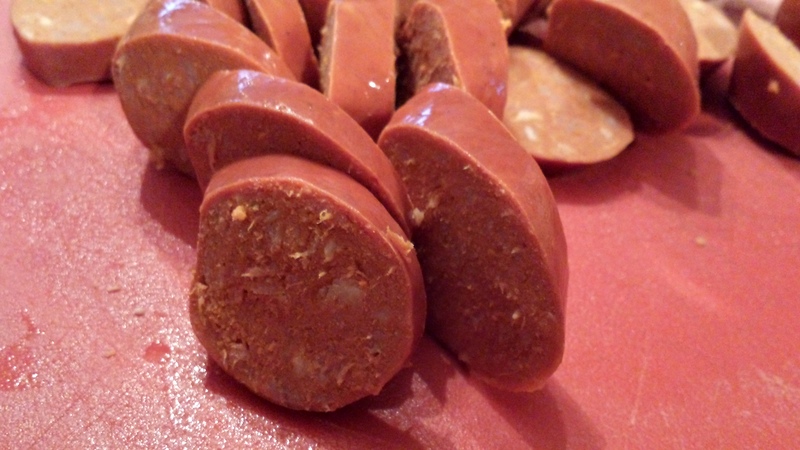 I you have never tried it, it’s almost like kielbasa, but it’s a little spicy and drier. It’s really tasty and leaves a cleaner taste than other sausage-type meats since it isn’t greasy. I can see myself using it in many other dishes! This recipe can be enjoyed at Shutters at the Caribbean Beach Resort. Set a large pot filled with water to boil. 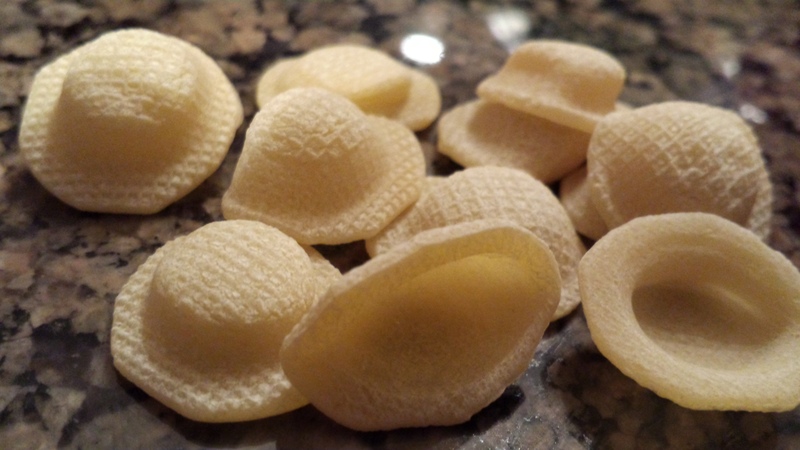 The recommended pasta to be used in this dish is called orechiette, and it’s the cutest pasta I have ever cooked with! They look like little sombreros and that makes me smile. How adorably fun are these! I used half a pound of pasta for the dish. The recipe from the website uses the measurement of ounces for all ingredients, so I winged it as I went along. My measurements will feed a family of four easily. Depending on the appetites, you may have some yummy leftovers for lunch the next day, and that is never a bad thing! While the water is warming up, get your vegetables ready. 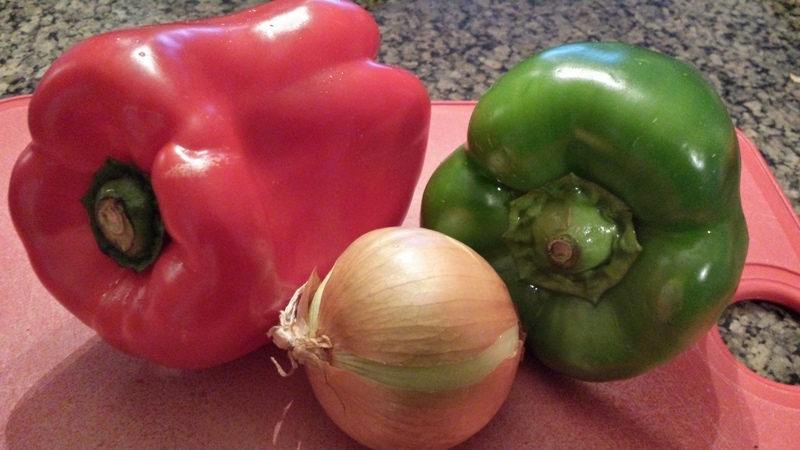 I sliced one red pepper and one green pepper in 1/2″ strips, then cut the strips in half. I also diced one small onion. 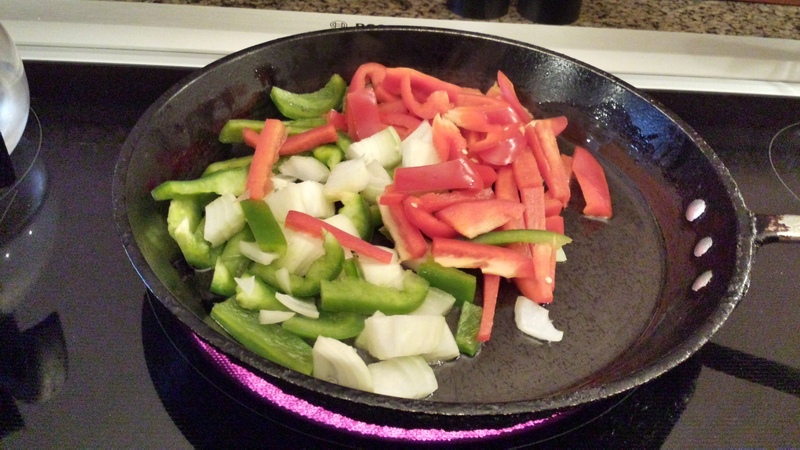 Get the vegetables into a warm saute pan (medium-high heat) coated with about 2 tablespoons of olive oil. This appears to be the beginning of an upscale peppers-and-onions dish. To be honest, I did not enjoy having the green pepper in the dish. The bold green pepper didn’t play well with the other flavors. I would suggest either using two sweet red peppers or even a red and orange pepper. The sweetness was needed in this dish to complement the spicy chorizo and the heaviness of the cream. Also something to note; I opted to leave out the jalapeno in this dish because my family doesn’t do spicy very well. If I had kept that ingredient, perhaps the green pepper would have gone with the dish better. The best thing about cooking is that you can always customize the meal to fit what you like! Now, let’s slice up the chorizo! 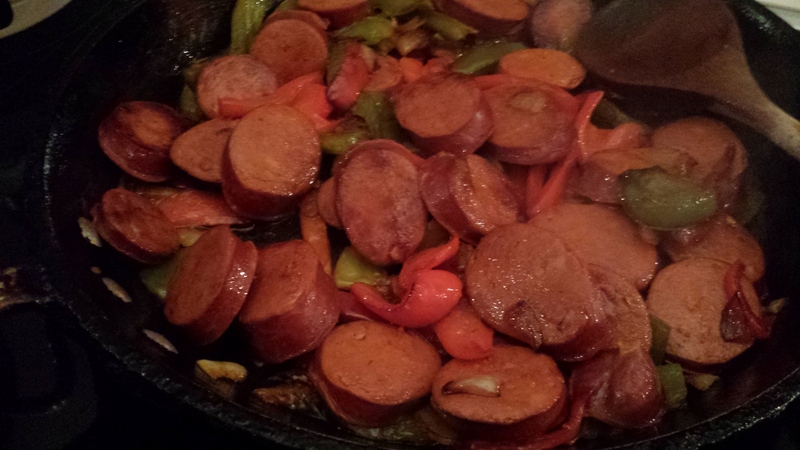 Once the vegetables have been cooking for about 5-7 minutes and are becoming tender, add the chorizo to the pan. Raise the temperature to high to get the meat caramelizing. You want to have a nice crust on the outside of the meat. At this point, your water should be boiling. Add the pasta and cook for about 20 minutes or until the pasta is al dente. Cook the vegetables and chorizo together for about 7-10 minutes, or until the vegetables are tender and the meat is slightly browned. Now turn the heat down to medium, and add the wine. I used two good splashed of wine, about 4 tablespoons. The wine will work to deglaze the pan. Once you add the wine, take a small whisk or spoon and mix the wine around to pick up all the small bits on the bottom of the pan. 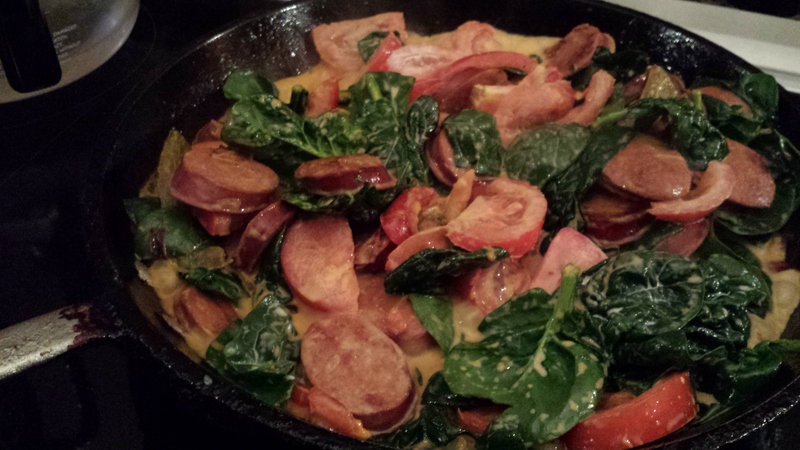 Those cooked bits of vegetable and chorizo hold a ton of flavor, so make sure to get them all released from the pan! See how the meat and vegetables have developed a darker crust. 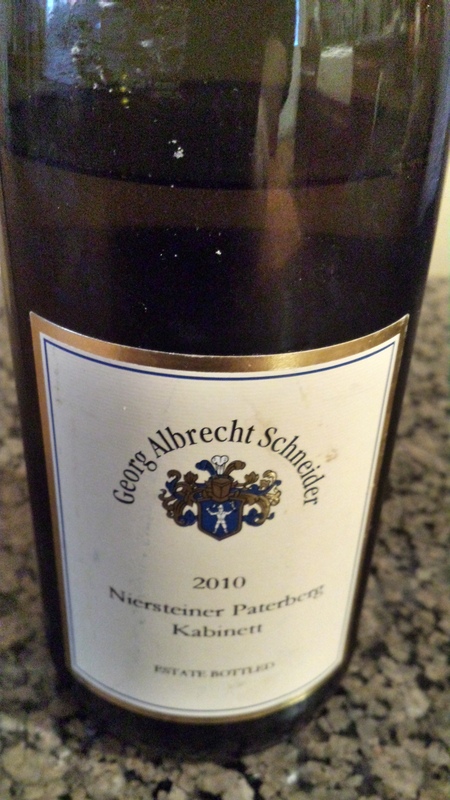 Let the wine cook out for about 2-3 minutes. Now it’s time to add the finishing touches. I sliced up two medium tomatoes, and added that to the pan along with a 1/2 pound of baby spinach. It’s important to let the tomatoes cook for about 5 minutes before adding the heavy cream and pasta. The sauce is very light, so you need to juices from the tomatoes to cook out or else your dish could be dry. Next time, I might try a large beefsteak tomato for extra juiciness. 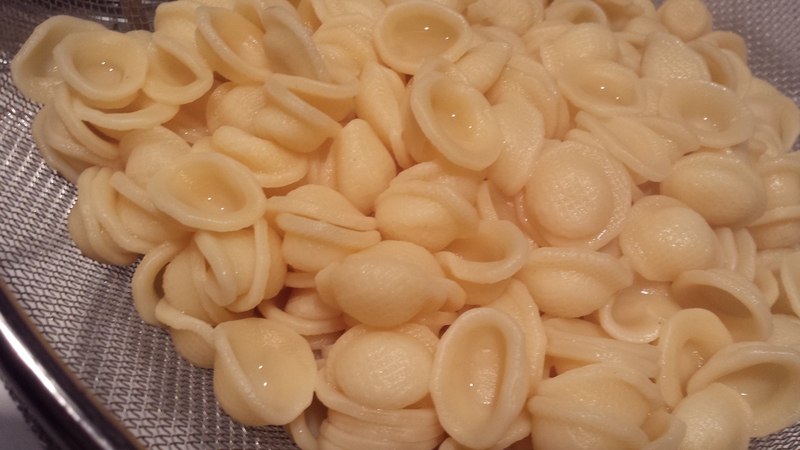 Once the tomatoes are soft, add 1/4 cup of heavy cream and the cooked orechiette pasta. Oooh, it’s coming together nicely! Turn the heat down to low and let the dish simmer for about ten minutes, just long enough for the pasta to soak up some of the flavor. After the dish has simmered, it’s time for my favorite part. I crumbled a 4 ounce log of goat cheese over the top of the dish. 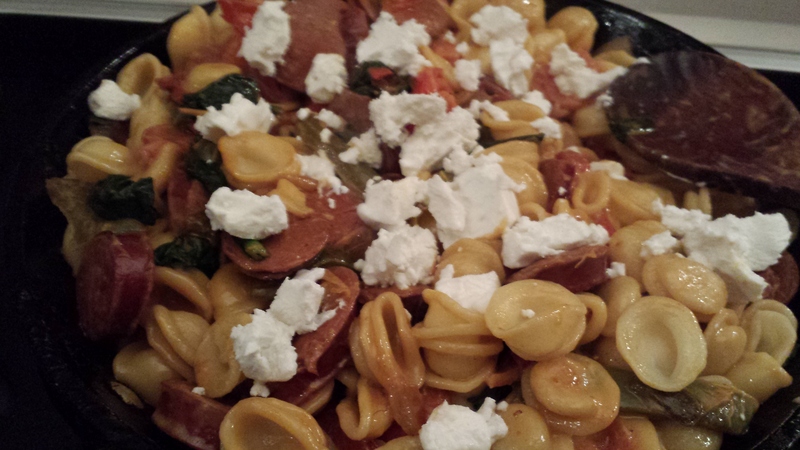 The goat cheese adds such a creamy texture against the meatiness of the chorizo and peppers, but also adds a tangy brightness to complement the heavy cream and wine sauce.The crumbled cheese nests inside the bowl-shaped pasta and pops in your mouth. I guess what I’m trying to say is, don’t skip the goat cheese in this recipe! And voila! Is that not the prettiest one-pot dish you’ve ever seen? Like I said, the dish was so simple to make and so easily customized that you need to do yourself a favor and try this dish!